Usage: Spectacular when used as mass planting for landscapping, parks and gardens. Plant Zehpyr lilies as ground covers for flower beds or scatter them in borders or in pots to beautify your home garden as they blend easily! 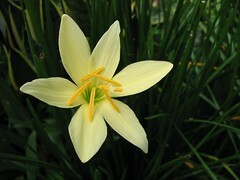 Care: Being hardy plants, they hardly need much attention besides the usual watering and fertilizing! Anyway, do keep the clumps neat and tidy by removing the dried and yellow leaves as well as deadheading. It’s advisable to occasionally check for root disease due to overwatering or excessive rainfall and treat it with pesticide to prevent speading! For temperate regions: Here is a well-informed site to know a little more about moisure and hardiness, especially for winter care! 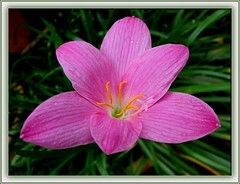 Would like to know whether your rainlily blooms everytime or only a season? Since we do not face winter here – do they need “cold-climate” experience to bloom graciously? James, our tropical climate of hot, sunny days with wet, rainy ones is very ideal for these beauties that would usually bloom after the rain following a dry period. No wonder I’ve seen them thriving and blooming well when planted along roadsides and roundabouts, needing least care. However, our plants aren’t blooming well ever since transplanted in pots and became congested over the years…humph!